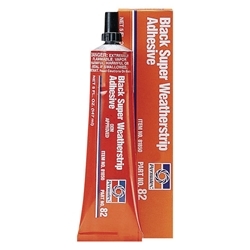 A professional, black weatherstrip adhesive that blends with automotive weather stripping for less clean-up. Withstands temperature extremes. Resistant to gasoline, kerosene, antifreeze and most solvents. Permanently bonds automotive weather stripping. Bonds automotive gaskets. A superior adhesive for bonding a variety of common materials.